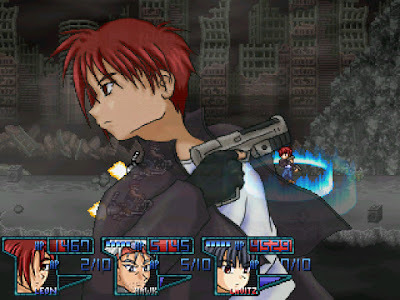 "One of the most celebrated games on the network, Alter A.I.L.A Genesis is a side-scrolling cyberpunk epic offering a thorough reworking of traditional JRPG gameplay. Genesis builds upon the existing RPG Maker 2003 combat system, adding an extensive resistance/damage-type system along with a escalating series of EX attacks and 'Field Effects' (environmental conditions) – all of which must be taken into account when building a team. Experienced JRPG players will recognise most if not all of these from other games; but in the context of a lengthy, free adventure built by a single creator it's impressive stuff. When it comes down to it, though, the combat system is the reason to give Genesis your time. If you're looking to sink a few hours into honing a squad, rooting out hidden areas and working on your boss strategies, this is your game." "A platforming-stealth RPG featuring a futuristic punk world and colorful cast of characters. The game does have turn-based battles when you encounter enemies, but its main gameplay involves stealth invoked through platforming. Surprisingly fun and interesting, mixing in original art with edits, it is different and worth it for anyone looking for a stealth-RPG-Platformer, a strange hybrid but one that works and executes it quite well!"